Altamonte Springs is positioned in the geographic heart of Central Florida. Conveniently located in Seminole County at the crossroads of Interstate 4 and State Road 436, Altamonte Springs is within minutes of any home or business in Central Florida. You are just 15 minutes from downtown Orlando and Orlando Sanford Airport and 35 minutes from Orlando International Airport. The I-4 corridor provides easy access to such major cities as Jacksonville to the north, Tampa to the west and Miami to the south. Webster University - and is just a few miles away from the University of Central Florida and the Crummer Graduate School of Business at Rollins College. In addition Seminole Community College offers custom-designed courses to fit the individual training needs of local companies. SaveOnHotels.com is the easiest way to help you find the best savings on hotels in Altamonte Springs, Florida. You can compare all of the Altamonte Springs hotel rooms including the major Altamonte Springs hotel chains using our unique guest rating system as well as Altamonte Springs hotel reviews to help find the perfect hotel room when booking your accommodation in Altamonte Springs, Florida. 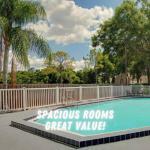 Why use SaveOnHotels.com to book your Altamonte Springs lodging & accommodation? When you make a hotel reservation in Altamonte Springs with Save On Hotels we'll send you email confirmations with the reservation details of your hotel booking along with hotel contact details, directions, information on nearby Altamonte Springs attractions, and if you get stuck, we're only a phone call away. To make the most of our service, check back frequently to view up to the minute Altamonte Springs hotel savings.